This chair cushion crochet pattern is free for all to crochet! 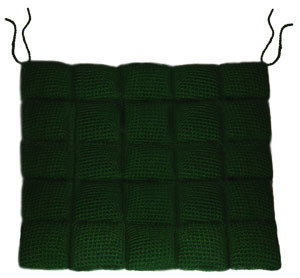 To make your chair cushion you will need to work each of the small squares separately. The squares are then stuffed and sewn together. You can make the cushion as firm or soft as you desire. Best of all, you can adjust the size of the cushion by adding more or less rows of squares as you see fit. Prior experience sewing crochet pieces together is a plus. Gauge Swatch: 3’’w x 2’’h (7.5 cm x 5 cm) ch 14. Note: you can increase or decrease the size of your cushion by adding or subtracting the number of squares you make. Finish off, leaving a long end for sewing. Fill square with fiberfill until it is the firmness that you desire. Then sew the opening of the square shut using a yarn needle. Using photo as a guide, sew the 25 squares together. Using photo as a guide, sew the center of the strap to the corner of the cushion. Use the straps to securely tie the cushion to a chair. Need help crocheting your chair cushion? Just ask me for help! Support Crochet Spot in creating more awesome patterns, by visiting the Crochet Spot Store. This entry was posted on Thursday, May 27th, 2010 at 6:00 AM by Rachel Choi	and is filed under Free Crochet Patterns. You can follow any responses to this entry through the RSS 2.0 feed. You can leave a response, or trackback from your own site. THANK YOU– I didn’t realize I needed this until I saw it here!!! Ditto to Maria. How do you come up with such great ideas? Can’t wait to make this! Wow! You are amazing! I never thoght of making something like this until now. My mom and I went shopping for these and she couldn’t find any to her liking. But these are cool-I can make them for her and customize them to match her dining and “bottom” comfort. Thank You. Rachel…I can’t see the pillow! It’s too dark. It is really dark green, but shows up really well if you try lightening up your screen brightness. Or, if you have a laptop, tilt the screen. Thanks, Rachel! I just bought a new car, and the seat makes my bottom hurt if I sit in it on long trips. I was going to buy a cushion, but now I’ll just make one! I love this. can’t wait to make it! Love this. need to make one for this desk chair I am sitting in. It would be so nice. Rachel, I have sewn crocheted pieces together, but I have no idea if I am doing it the best (or correct) way. I haven’t found instructions on your site. Do you have any? Thanks so much for all your help. I`d love to try to make it:) Thanks for the idea! The cushion is black, so I cannot see any detail. Am I the only one? I love all your patterns and I’m sure this one is great, but sure would like seeing what it looks like. I accidently bumped into your website and found this cute chair pad pattern……thank you so very much for sharing…cannot wait to finish my chair pad!!! Just found this pattern while looking for a foot stool pad to make as a gift for my mom – can’t wait to start making it. These look really comfy….are they washable too? Sure, you can wash them Laura. Just be sure to crochet it with a washable yarn. I guess I don’t exactly understand how a square is made in one piece. Hi MaryLee, try taking a look at the “work into remaining loops on opposite side of ch” tutorial that’s linked in round 1. That may help explain how each square is made. Oh, Thanks. I had looked at the tutorial, but it wasn’t clear. NOW it is! I have a captains chair. Is there any way to modify this so that the back is thinner than the front? Yes, you can fill/stuff each square differently. You can purposely fill the back squares with less filling than the ones in the front.